Well, 2010 is in the books and 2011 is upon us. I hope you had a safe and happy holiday season. I had a wild time with the blizzard of '10 and some high drama at the airport last week, but it's all good now. In 2010 I experienced some great timeshare destinations, was able to share some wonderful stories with you and, aside from my dust-up with that bull in Pamplona, nobody got hurt. I can't wait to see what 2011 will bring. Changing the date did not interrupt the traditions and superstitions associated with the start of a new year, however. If anything, it probably made for some new ones. Did you know that in many cultures the first visitor you receive on New Year's Day is an indicator of the type of luck you will have for the year? Yeah, a tall dark-haired man is a harbinger of good things to come, while blondes, redheads, and women are bad luck. Hmmm, I think if I receive a unannounced, blonde, female visitor on the first of the year, I am going to take my chances - but that's just me. It's also considered bad luck to work on New Year's Day, which I personally observe, as well as loaning or borrowing money, doing laundry, or removing anything from the house - even the garbage. The loan business makes a fair amount of sense, and is probably where the bank holiday tradition comes from, but not putting out the garbage? That just seems like an invitation for bad luck to me - not to mention bad odors - and I won't be adhering to it any time soon. Some traditions, especially those involving food, are purely regional. For example, in the southeastern United States it is common to eat black-eyed peas on New Year's Day. Throw in some ham hocks, cabbage, and collards (all lucky), and you've got yourself a year's worth of good luck in a bowl. Rent a timeshare in Colonial Williamsburg, Charleston, SC, or the Great Smokey Mountains of Tennessee in 2011 to learn more about southern traditions. In Italy, lentils are the lucky legume and are to be consumed in healthy portions for the new year. If you wish to celebrate this Italian tradition, why not rent a timeshare at Borgo di Vagli, the only fully restored 14th century Tuscan village timeshare resort? If beans aren't your thing, how about grapes? In Spain's wine growing regions it is traditional to eat one grape for each month of the outgoing year. This tradition followed everywhere the Spanish empire spread, and you can now enjoy twelve grapes on New Year's Eve from the beaches of Puerto Rico to the Mexican Riviera of Mazatlan. I guess for many Americans, two relatively modern events represent New Year's more than any others: the Rose Bowl & Parade in Pasadena, CA, and the ball dropping in Times Square, New York City. The parade of roses started in 1895 and the first football game was held in 1902. Legend has it that many of the recent eastern and mid-western arrivals in Pasadena were so enamored with the mild California winters, that they wanted to rub it in a bit with the folks buried in snow back east; which is a little mean-spirited, really, but what a beautiful spectacle it has become. You can rent a timeshare in Anaheim, about 45 minutes away, and hit Disneyland while you are at it. If the folks back in New York were put out by the flowery display, they didn't let on. Right around the same time, 1904 to be exact, the tradition of the ball drop began. Every year since, millions of people ring in the new year by watching the Waterford Crystal orb make its 77-foot decent upon Times Square. You can take in Times Square and all NYC has to offer, without breaking the bank, by renting a timeshare at The Hilton Club New York. 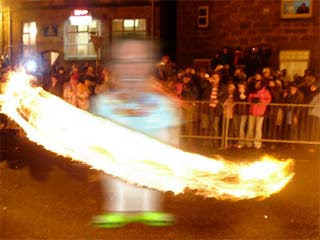 Well, I am off to put the finishing touches on my Hogmanay fire ball. Do you know about these things? It's a traditional New Year's practice I picked up while traveling in Scotland. And while it may sound like a flaming glass of whiskey you drink at midnight, it's actually a giant ball of chicken wire that you stuff with paper, sticks, rags, and other flammable items. You attach it to a nonflammable rope or chain - a very important detail - light her up, and take to the streets swinging the thing over your head like a maniac. In Stonehaven, from where this tradition originates, thousands of people turn out to view this annual spectacle. To my knowledge, I am the only person on my block who partakes in this particular practice. So I am either going to start a new trend here, or I am going to get arrested. Either way, I am going to start 2011 off with a bang! I would love to see what the Seymourian calendar would be like! Nice photo of you with the fireball! What a wild tradition. Hope you didn't singe an eyebrow. Looking forward to all of your 2011 posts, Seymour! Your articles are funny, informative, and a highlight of my week - no kidding!